Parents with autistic children are often concerned about the issue of autism and nonautistic siblings. An autism diagnosis affects the entire family because of the daily requirements of many autism interventions. Despite the demands of life with autism, people with autism and their nonautistic siblings can have a happy family life with the right intervention and support. In families dealing with autism, balancing daily life activities can be difficult. Parents and nonautistic siblings may sometimes feel like the main family focus is on the child with autism. Siblings of children with autism often assist parents in the care of the affected child. Does life with autism have a positive or negative effect on nonautistic siblings? According to a Time.com article, "Autistic Kids: The Sibling Problem", a significant number of siblings of people with autism go into autism support service careers. Studies on the development of siblings of children with autism suggest that the daily demands of family life can potentially have both positive and negative effects on nonautistic siblings. Childhood development studies provide evidence that although some siblings of children with autism experience language and social skill difficulties, many siblings develop social and language skills in typical age-appropriate ranges. A 2003 Hebrew University of Jerusalem study compared the language abilities of 27 siblings of children with autism to 23 siblings of children with mental retardation of unknown etiology (MR) and 22 siblings of children with developmental language disorders (DLD). The study analyzed the three groups of siblings using formal language tests as well as testing for IQ and academic skills. The researchers found that siblings of children with autism did not exhibit language skill problems. A 2007 University of Washington study contradicts the Hebrew University findings. Researchers at the University of Wisconsin Autism Center and Center on Human Development and Disability studied the language, social interaction, cognitive, imitation and play skills of 42 toddler siblings of children with autism and 20 toddlers with no family history of autism. The nonautistic siblings had lower scores in comparative IQ and in the use of words or expressive language and social smiles. Parents of study participants noted that some of the children experienced noticeable delays in social skills by 13 months. Researchers urged early intervention for nonautistic siblings to make sure that they do not fall behind. 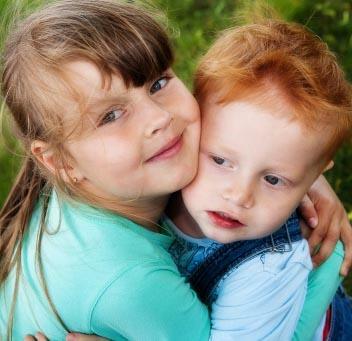 Current studies on the sibling interaction between nonautistic children and autistic children demonstrate that sibling relationships can be mutually beneficial and positive. A 1995 Lancaster University (UK) study observed 30 sibling pairs, where half of the siblings was affected by autism and the other, by Down's syndrome. Researchers found that the group of autistic children did not always respond to their nonautistic siblings' attempts to interact but they showed significant evidence that positive sibling relationships encourage social interaction. A 2001 University of Calgary (Canada) study compared the sibling relationships between children with autism, children with Down's syndrome and nonautistic children between the ages of 8 and 18. The study indicated that the siblings of children with autism and Down's syndrome demonstrated more admiration for their affected siblings and exhibited less rivalry and arguments than the nonautistic group. Many early studies, researchers argued that early intervention is necessary for nonautistic siblings to prevent social and emotional problems. New studies suggest that nonautistic siblings are generally well adjusted. A 2004 Hebrew University of Jerusalem study compared the emotional and social development of 30 siblings of children with autism, 28 siblings of children with MR and 30 siblings of children with DLD. The study found that most of the nonautistic siblings were well adjusted. A 2010 University of Oregon study compared 20 families with an autistic preschooler and an older nonautistic sibling of elementary school age to a control group of 23 nonautistic families. The study found that nonautistic siblings were well adjusted emotionally and socially. However, a significant amount of teachers reported behavioral problems and hyperactivity that was only present at school. Explain autism to help nonautitistic siblings better understand the child with autism. Get help from therapists and autism support organizations for the entire family. Autism experts and other families experiencing autism can provide strategies, advice and comfort on how to deal with daily life. Help the nonautistic and autistic children build a relationship. Make special one-on-one time for the nonautistic child on a regular basis. Don't force the nonautistic sibling to be a constant caregiver of the autistic child. Allow the nonautistic sibling to have time to enjoy her childhood. There is hope for children with autism and nonautistic siblings to have a happy family life. Early intervention and parental involvement can create can help families thrive.